Homer's Iliad is the stuff of legend and is focused around the Trojan wars. The date at which it was written is a subject of much debate although it's thought to be around 8th century B. C. Its influence through time is unmistakable. 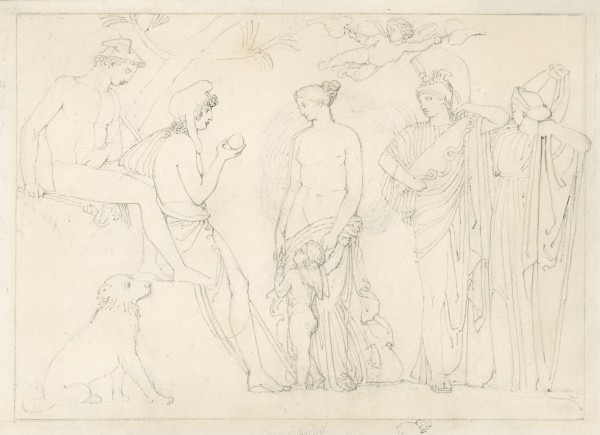 Flaxman himself read the story as a boy and would have been familiar with the tales. The Iliad tells the story of the last years of the Trojan War. Set on the western coast of modern day Turkey, the city of Troy has been under attack from the Greek armies, lead by Agamemnon, for almost 10 years. It started after Paris of Troy stole Helen from her husband Menelaus. The two secretly returned to Troy together and Agamemnon, the brother of Menelaus, rallied the Greek armies of his allies and went to Troy in order to seek revenge. The Iliad covers only 45 days of the conflict. On the first day the poet describes Achilles as inconsolable with rage, angry at Agamemnon for his refusal to release a woman he has taken as a prize of war, even though her presence in the Greek camp has angered the god Apollo and caused a plague within their camp. 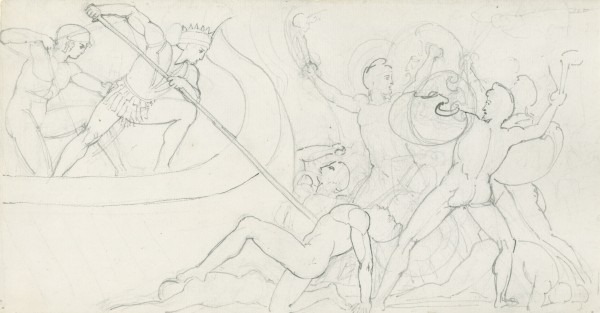 Achilles and his warriors withdraw from the battle. A few days after the fighting had resumed, Hector proposed another duel to settle the battle once and for all, this time between himself and any warrior of the Greeks' choosing. Ajax was chosen and the duel commenced. Night fall brought it to a swift end and the two sides returned to their camps to bury their dead. Over the next few weeks Zeus, King of the Gods, made a point of telling the other deities to stay out of the battle and he weighed up the fates of the two sides himself. He favored the Trojans and by nightfall they were camping on the plains of Troy, ready to attack the Greek camp on the beaches at dawn. The Greek council met once again to discuss their fate. Whilst Agamemnon suggested leaving, others were in favor of standing their ground. 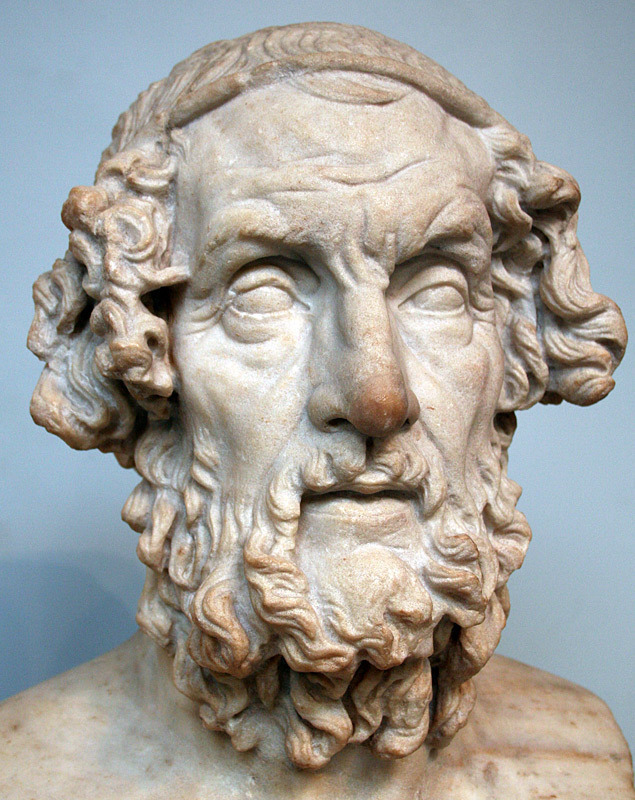 Nestor persuaded Agamemnon to approach Achilles, as the introduction of him and his Myrmidon warriors would surely sway the war in their favor. Agamemnon reluctantly agreed and sent Odysseys and Ajax to approach the hero. 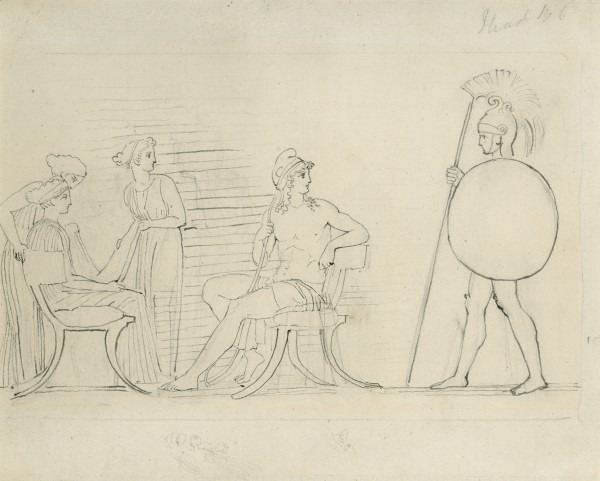 Achilles refused and thus the war continued. The next day Agamemnon led the Greek armies to battle with Zeus but he was distracted by his wife. The sea god Poseidon therefore rallied the failing Greek army. 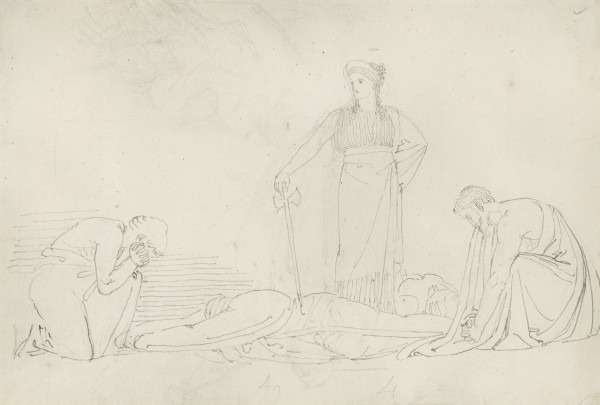 When Zeus awoke and saw what has happened in his absence he sent Apollo to revive the fallen Hector. The battle continued until the Trojan army was at the Greek ships. Hearing the close battle, Achilles' friend and fellow warrior, Patroclus donned the armor of Achilles and with the hero's permission led the Myrmidons into battle. Patroclus was killed by Hector and a distraught Achilles was forced to rejoin the battle and seek revenge for this. The following day Achilles set out on a murderous rampage, killing so many Trojans that the River Skamandros was brimming with their bodies. Apollo was dispatched by Zeus to slow Achilles down so that most of the Trojan army could escape to the safety of the walls of Troy. Soon only Hector remained. A frantic chase began between Hector and Achilles around the city walls. As Achilles caught Hector he struck a fatal blow through the gap in his armor to his neck. 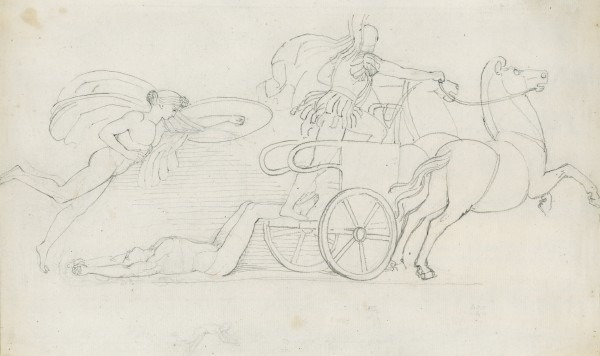 Achilles then dragged his body on the back of his chariot back to his tent in the Greek camp. The body of Patrokonos was burnt on a traditional funeral pyre and Achilles oversaw funeral games held in his honor. With each day of games, Achilles rode his chariot around the walls of Troy, dragging Hector's body behind him. Zeus instructed Priam, Hector's father and the King of Troy, to go to Achilles with offerings and to ask him to return his son's body. Priam obeyed and slipped into the Greek camp under the cover of darkness. He pleaded with Achilles and the warrior, taking pity on the old man, agreed. A truce was called between the two sides and another 12 days of funeral games were held in Hector's honor.